This series assumes that you are familiar with the “HTML Calculated Column“. The “HTML Calculated Column” is a powerful method that I created for SharePoint 2003 and 2007. It allows you to display in your SharePoint lists any kind of HTML: color coded text, inline charts, tooltips, embedded videos, etc. 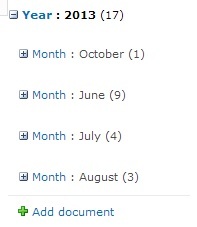 I am receiving more and more requests from readers who want to use it in SharePoint 2010. As I explained in a previous post, step 2 is tricky in SP 2010, due to asynchronous updates. At this point, I don’t have a perfect answer, but I figured I’d just start sharing what I have so far. Expect this to be a long series, where I’ll publish updates as and when I validate more options. Your feedback and suggestions will be essential to guide me in my investigations. With the AJAX options disabled, the view will behave like it did in SharePoint 2007, and the Text to HTML script will work (well, you tell me…). Maximum number of IF statements in a Calculated Column? I just answered a question on the Stump the Panel forum, and thought others could be interested. For example, if the [Status] column contains Choice5, the output of the formula will be DarkCyan. So here is the sad truth: you cannot have more than seven nested IF statements in a calculated column. When users discover this – by trial and error, via a forum, or from their experience with Excel – the next step for them is usually to try and break their formula across multiple columns, each containing a maximum of seven nested IFs. However, in most cases there is a simpler way. And voila, a formula that fits in one calculated column, with 15 IF functions! Ok, I’ll update it… but seriously, is it reasonable to use more than 7 colors for color coding? For the record, IF is not the only SharePoint function allowing to build conditional formulas. See for example in this post how I used the CHOOSE function. And yes, there will be another formula generator built on CHOOSE! If you haven’t used this method yet, you’ll need to learn it to take advantage of these tutorials. For the latest information on the HTML Calculated Column, start with this post… or attend one of our live online workshops. What immediately comes to mind is to use a set of icons. But the above examples offer a lighter solution: welcome to the world of unicode graphics! For the graphics, scroll down to the “Symbols” category. – unlimited choice of colors, for both the graphic and the background. – the rendering is not bound to an external image. This means better performance. Also, it makes it easier to save the SharePoint list as template for reuse in other environments (I’ll provide such a template in an upcoming post). ="<span style='background-color:black;font-size:24px;'><span style='padding:-10px;color:"&IF([Color]="Green","green;'>✹","gray;'>✹")&"</span><span style='padding:-10px;color:"&IF([Color]="Amber","RGB(255, 191, 0);'>✹","gray;'>✹")&"</span><span style='padding:-10px;color:"&IF([Color]="Red","red;'>✹","gray;'>✹")&"</span></span>"
Where the [Color] column can take the values Green, Amber or Red. Why use unicode characters, and not simply fonts like Webdings, Wingdings, or Zapf Dingbats? Those too offer graphics, but there is a downside: these fonts are not standard, and they don’t work cross-browser (and never will, from what I read). Such graphic fonts could still work for you if you are in a corporate environment where your internal policy enforces the use of Internet Explorer. Unicode seems to work in all modern browsers. I tested it in IE7, IE8, Firefox, Chrome and Safari. Well, I think the easiest way to understand this is to see it in action! How it works (source Asterisq): Mentionmap loads each user’s Twitter status updates (tweets) and finds the people and hashtags they talked about the most. […] In this data visualization, mentions become connections. Click for example on endusersharepoint.com to see which blogs linked to it (remember, the data is from January). I dropped the idea because it didn’t work out so well with Technorati – the data was too scarce to be meaningful. So, let me know if Mentionmap works for you! Does the graph help you discover useful connections? And for Lord of the Rings fans: check out this experiment on timeline visualization, also by Daniel McLaren. In my last post, I introduced sparklines and their applications. Today, let’s see on an example how to build simple bar graphs in a SharePoint list. – the number of calls (too many support calls will kill my margins). – the trend: call numbers should decline, as I address initial issues and improve the Quality of my product/service. While the above table contains all the data I need, it is not easy to read. By including sparklines next to the numbers, I’ll be able to visualize both the level and the trend, for each item (cf. first screenshot). Ideally, a visual signal (for example a change in color) would alert me when I pass a certain threshold, but we’ll leave this for another day. For a homemade solution, the easiest type to build is a bar graph. With more advanced tools, like the jQuery sparkline plugin, I could also opt for a line graph or a discrete chart, as shown in this screenshot. 2/ Apply the “Text to HTML” script that will change the HTML string into actual HTML. If you haven’t used the “HTML calculated column” method yet, you’ll need to learn it first (it’s really worth it if you are interested in visualization solutions). For the latest information on the HTML calculated column, start with this post. If you are already familiar with this method, you’ll find below the formulas needed to render the bar graphs. For a first pass, feel free to skip the tedious explanations and simply copy/paste the formulas for the HTMLstring and BarGraph columns. Let’s start with a single bar for January. Once we get that, we’ll just replicate it for each month. To adjust the graph size, I need to know the maximum value for my table data. For this, I am adding to my list a column, called Max (see first screenshot). In my example, I have chosen a fixed value of 2000 for Max, but I could also have entered a formula based on the content of other columns. – calculate the height of my bar: 20*Jan/Max pixels (the maximum height will be 20 px). Note: the tag name (here a “b” tag) doesn’t really matter as long as I can assign a background color. In theory, we would just need to repeat the above formula 12 times to get the chart for the whole year. Except that we hit a road block here: the complete formula will have a length of 12×150 characters, plus a wrapping tag. That’s far too much for a calculated column, which will “only” accept 1000 characters. ="<span style='white-space:nowrap;'><b style='display:inline-block;height:20px;'>"&HTMLstring&(Jan*20/Max)&"px;' title='"&Jan&"'>"&HTMLstring&(Feb*20/Max)&"px;' title='"&Feb&"'>"&HTMLstring&(Mar*20/Max)&"px;' title='"&Mar&"'>"&HTMLstring&(Apr*20/Max)&"px;' title='"&Apr&"'>"&HTMLstring&(May*20/Max)&"px;' title='"&May&"'>"&HTMLstring&(Jun*20/Max)&"px;' title='"&Jun&"'>"&HTMLstring&(Jul*20/Max)&"px;' title='"&Jul&"'>"&HTMLstring&(Aug*20/Max)&"px;' title='"&Aug&"'>"&HTMLstring&(Sep*20/Max)&"px;' title='"&Sep&"'>"&HTMLstring&(Oct*20/Max)&"px;' title='"&Oct&"'>"&HTMLstring&(Nov*20/Max)&"px;' title='"&Nov&"'>"&HTMLstring&(Dec*20/Max)&"px;' title='"&Dec&"'></b></span>"
The solution described in this post gives a nice result, you’ll notice that I have even included a hover effect that allows to read the values directly on the sparklines. However, there are a couple limitations. First, we need to build each graph by hand. Then, with those monster formulas, we quickly reach SharePoint’s limits – 1000 characters for the formula, 2000 characters for the calculated field. For the record, my above example consumes 665 characters for the formula, and ~1700 characters for the calculated field. 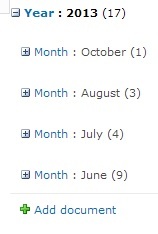 Note that I chose on purpose very short column names for the months, to shorten my formula. This is also the reason why I chose “b” tags. In Wednesday’s live online workshop, you’ll have the opportunity to practice this method. We’ll also review other business scenarii, and learn other techniques allowing to build more advanced inline charts, for example using the jQuery sparklines plugin or the Google charts. To give you an idea of the result, check out these screenshots from Mark Miller. You’ll find the updated files under the “download” tab. First, I am responding to comments from readers on the EndUserSharePoint.com blog. Several months ago, Jim Bob Howard posted an example using my method. His post offers detailed step by step explanations, and is very popular. However, a few readers reported issues with the calendar week/day views, which didn’t render the colors in some configurations. The code I posted today aims at fixing this issue. – a light version, for both SharePoint 2003 and 2007, that applies the rendering to displayed items only. – a full version, SP 2007 only, that applies the rendering to displayed and hidden items (grouped views, preview pane, etc.). Be aware that this version encapsulates some of the SharePoint OOTB code. Tell me again, what is this “HTML Calculated Column”? For more explanations, read the original article. To be fair, the method also has its flaws. It leverages the OOTB calculated column, but also relies on a client side script to render the HTML on the page. If you don’t feel comfortable with the “hack” part (TextToHTML script), note that you can avoid it if you use the method with a Data View Web Part, a Content Query Web Part (see above link: KPI roll-up), or an XML source (RSS, URL protocol, Web Service). Why two different file formats, .dwp and .txt? I am releasing the code in two formats: Web Part (.dwp) and text (.txt). The .dwp file is for your convenience, if you only use the method sporadically, or for the first time. Simply import the Web Part to your page and you’re good to go. It is just a Content Editor Web Part containing the script. If you plan to use the method on a regular basis, you should grab the text file instead: store the code in a central location and point to it. This will greatly facilitate future updates. For more details on this “best practice”, read this article. – Remember that the Text to HTML script must be placed below the lists you need to modify. – The HTML you create via the calculated column must follow the HTML standards. For example for calendar views you’ll need to use inline elements (“span” for example), not block elements (like “div”). I am currently working on version 3 of the script, which will make the method work on column filters, and headers of grouped views. Some people have already received intermediary versions, and I am waiting for their feedback. I am also listening to feedback on the current version (big thanks to the readers who shared their findings!). For example, the use of the method in discussion lists, blogs or wikis will require more investigations. How can I be informed of upcoming releases? The preferred way is to subscribe to the RSS feeds, either for this blog or for my SharePoint downloads library. If you don’t use RSS, feel free to contact me, and I’ll send you an e-mail when v3 is out.